With all the reports about millennials dealing with mountains of student debt, it can be tempting to skip the college experience altogether. No student debt means you’ll be able to keep the money you earn, right? Wrong. Actually, a college degree has become the building block for most career options. Without one, you’ll be hard-pressed to find a job you’d be qualified for and earn a meaningful salary to begin with. There are in fact several benefits to having a college degree. By putting the work in now, you’ll be able to reap the rewards later. Job candidates who have a college degree tend to qualify for jobs that pay more over those who don’t. Even getting a two-year Associate’s degree can help get you to a higher pay level. Let’s say you took an entry-level job and are looking to move up in the company. By having a degree, you’re showing your employer you’ve taken the time to acquire more skills and be more knowledgeable about your field. This would in turn allow you to take on additional responsibilities at a higher salary. Just try searching online for jobs paying more than $50,000 annually without a college degree as a prerequisite. If they do exist, they’re few and far between. Just by having a Bachelor’s, more options are open to you. Some jobs don’t even specify what degree is required, just that you have one. Others will go on to add that a Bachelor’s is required and a Master’s is preferred. This means that the higher your degree, the better chance you have of getting called for the interview. It’s no secret that there is some major competition out there, especially for the dream jobs. The more education you have, the more training and experience you can get, the more qualified you are over those who don’t. You won’t know just how many others are applying for the position you’re interested in, so you’ll want to do whatever you can to set yourself apart and prove you have what it takes to do the job well. It stands to reason that if having a college degree qualifies you to apply to more jobs with a higher pay rate that you’ll also be able to get greater benefits. Those with college degrees tend to work in higher-ranking jobs than those who don’t have a degree. These higher levels of employment usually come with better benefits such as health and dental insurance, a 401K, and other health benefits (i.e. gym membership). One of the best benefits that can come from a college degree is learning from the professionals. Often, professors at colleges and universities have experience in the field they are teaching and can provide advice not just on the syllabus, but on how to apply what you learn to the real world. By establishing a positive relationship and working with a mentor, you have a professional in the field who can help recommend employment opportunities, write letters of recommendation, and help you get your foot in the door. In addition to having a mentor, college gives you the chance to create a network of friends, both in your field of study and beyond. By staying in touch with one another, you can give each other advice on where to apply, what the job market is like in different parts of the country, and provide support. Some people even go on to combine their resources and start their own businesses. At times when finding employment can be challenging, especially for millennials, it’s a comfort to know that there is more job stability for those with college degrees. We all deal with financial burdens, but for the most part, those with a degree fare better than those without one. Between oral presentations, group work, and the number of essays students have to write, it’s no surprise that college graduates are better communicators than those who did not attend college. You know how to write a professional e-mail without using social media abbreviations. You can use PowerPoint and Excel with ease. And after giving a presentation in front of a lecture hall full of students, giving a business pitch to a small group is a piece of cake. Be sure to share your experience in your application or during your interview. Besides your mentor and your college friends, graduates also have the benefit of utilizing their school’s alumni networks. Depending on the school, you can access articles for advice, reach out to other budding professionals, or even find job opportunities. Being a part of your school’s Alumni Association gives you a great resource to tap into. You may even find a job at your university. Too often millennials are finding out it’s not just about what you can do, but who you know that lands you the job. Name dropping isn’t something everyone sees as a tasteful way to get the upper hand, but if it works, try it. Sometimes the name of your college or university can grab someone’s attention. Other times it may be the name of a professor you included in your cover letter. Use the connections you established during your college years and see where they get you. 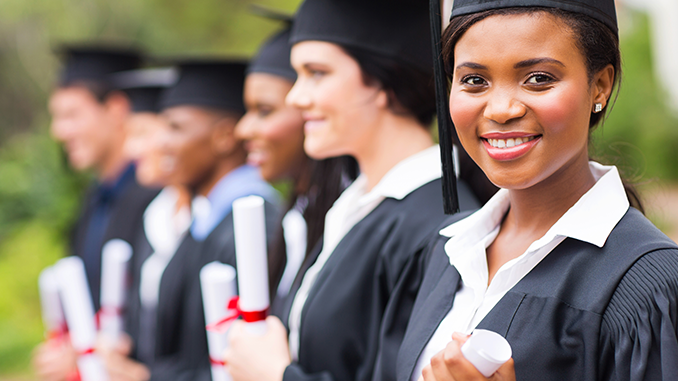 A college degree is an extremely valuable tool to have when applying to jobs. Without one, you’re at the bottom of the applicant pile. To have your best chance at getting the best possible job for you, get a degree.